Honesty really is the best policy. 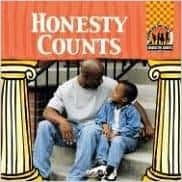 These books about honesty for kids should be a lot of help as you are raising your children to have integrity. Character development is very important to teach kids, and we cannot leave it up to the world because what the world values is often opposed to what God values. My character development series features on 52 character traits (one for each week of the year). It has 7-9 lessons that should aid as you are bringing up your kids with integrity. Just hover over my character development tab to reveal all of the traits. 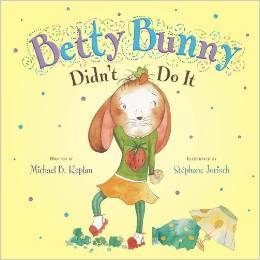 Betty Bunny Didn’t Do It – This is the second book I’ve read about Betty Bunny. Just as the book I reviewed before, this one makes is clear that Betty is quite a handful. In this story, Betty Bunny breaks a lamp, but she claims she didn’t do it. When asked who did, she replied, “The Tooth Fairy.” This book continues with Betty Bunny’s first real experience with lying and learning the importance of telling the truth. People can’t believe you when you are telling the truth if you become known as a liar. Betty also needs to learn that telling the truth is good, as long as it doesn’t hurt someone’s feelings. The story is an enjoyable read, and the character of Betty is well developed and lovable despite her difficult nature. She reminds me of Ramona in that sense. The final sentence of the book is super cute as Betty Bunny tries to bring it all together. Honesty Counts (Character Counts) – This is a book in the book series called “Character Counts.” We have a number of books in this collection of this style. It’s a direct instruction book with real pictures that give a very cut and dry picture of what it means to be honest. These books are helpful in defining honesty and giving examples of what honesty looks like in life. It explains that there are consequences when you don’t tell the truth. It gives you a list of reasons why you should be honest. It shows the danger of little lies too. It is good to give kids clear answers like this. A New Friend – How do you make friends? The rat in this story thought he might be able to make new friends by stealing their stuff and then being the hero who returns things. However, he is caught in his dishonesty and has to learn that stealing is no way to make friends. 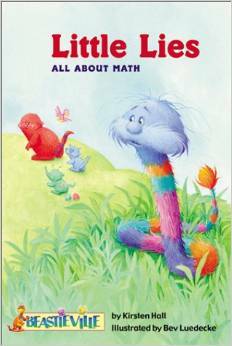 This book is a rhyming book that has bright, fun illustrations. I like that the story had engaging questions at the end. It was a decent story but had room for improvement. Tell the Truth, B.B. Wolf – This is the second story I have read about B.B. Wolf. Since I grew up with all the Fairy Tales mentioned in the book, it is fun. B.B. Wolf (AKA Big Bad Wolf) is reformed. He is a new man. In this story, the librarian asks him to come to the library and share the story of the three little pigs. He is embarrassed about his past and decides to tell a dishonest version of the story, which clearly explains why he accidentally blew the houses down. The pigs in the peanut gallery keep shouting, “Tell the truth, B.B. Wolf.” He eventually comes clean, apologizes and says he is a new wolf. He then proves his new character by building the pigs a brand new home. I really enjoy these stories. Both the illustrations and stories are well done. It’s a fun twist on your traditional fairy tales. Little Lies: All about Math (Beastieville) – This was a little rhyming book about lying that features the Beastieville monsters. It definitely teaches honesty and shows how being dishonest turns friends away. The little monster learns the hard way that lying breaks trust. Luckily, he has friends who will speak the truth to him in love. This book has other learning opportunities. It gives guides at the end to count throughout the book, talk about kids’ responses or try and read the word list featuring the words from the book. 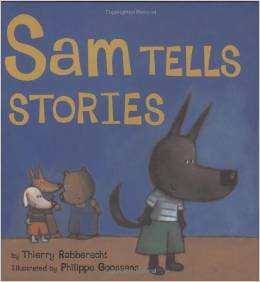 Sam Tells Stories – The is a cute little book about a dog named Sam who moved to a new school and decided he would seem a lot more interesting if he told his new friends that his dad was an astronaut. It worked. People thought he was interesting, so his lies began to grow. He began to lie to his siblings and parents too. He finally learned that honesty really is the best policy as he was caught in his lies. 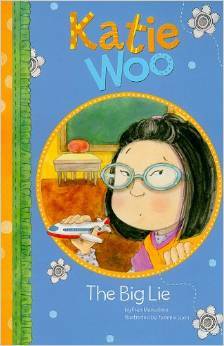 The Big Lie (Katie Woo) – Katie Woo saw a school friend playing with something she wanted. She took her friend’s new toy and lied about it. She continued her lies until her conscious started to eat away at her. She finally confessed, and all was made right. 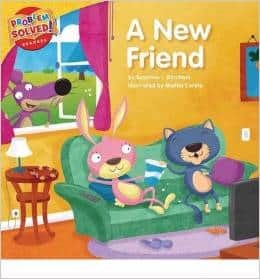 It is a good book to help teach the topic of honesty, but there’s nothing too unique about the story or artwork. 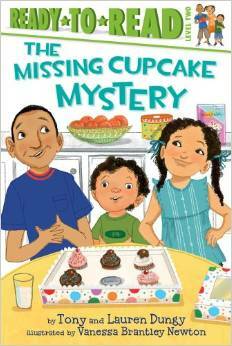 The Missing Cupcake Mystery (Ready-to-Reads) This book was fairly good. It handles a topic that I’m familiar with from my own parenting experience – kids sneaking thing they are not suppose to have. I like that it shows that this is dishonest behavior. I also like that the parents approach is similar to our own. We celebrate when our kids do finally tell us the truth. The difference, however, is that we still have a consequence. The consequence is just less if they come clean with it rather quickly. It was a relatable story, but there was nothing else too unique about the writing or illustrations. 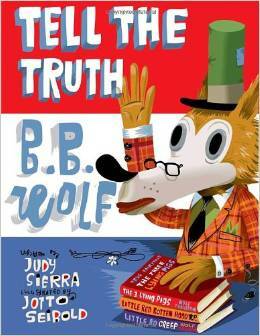 Overall, I think it is a good book to show kids that, as they are wrestling with honesty, it is best to come clean. 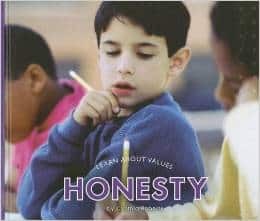 Honesty (Wonder Books: Level 3 Values) – This is a practical book with real pictures and real situations. It gives tangible examples of how to honest in a variety of situations. It is a direct instruction book rather than a story. It shows kids (and probably some adults too) how to be honest at home, at school and in the community. 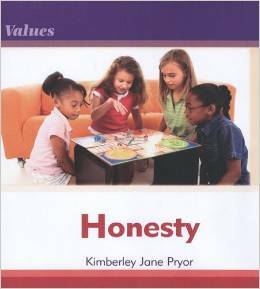 Honesty (Values) – This is another straight forward book about honesty. It defines what it means to be honest. It shows what it looks like to be honest with family, friends and neighbors. It addresses topics like: telling the truth, not stealing, not cheating, being fair, being trustworthy and being reliable. It emphasises the importance of living with integrity. This is not a story but rather a book that gives a clear cut picture of this character trait. It has pictures of real kids, which I think helps kids identify with what is written. 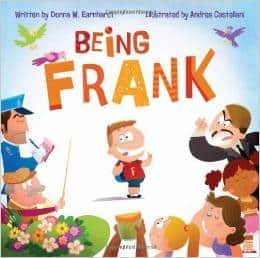 Being Frank – This is one of the most adorable books I’ve read in this character development series. I love it and highly recommend it. Frank is a boy who likes to tell the truth, but the truth can be brutal. He has learned in his life that honesty is important. So, he tells someone exactly what he thinks, and it often gets him in trouble. His grandpa used to be as frank as Frank, but he learned how to be honest but kind at the same time. He teaches Frank to do the same. The illustrations are a lot of fun. The story captures kids and teaches them important lessons about how to find that balance between honesty and weighing words so that people can be respected. 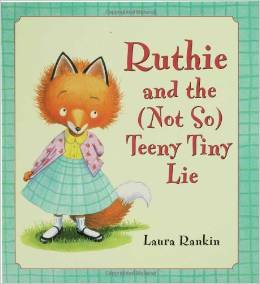 Ruthie and the (Not So) Teeny Tiny Lie – I love this story about Ruthie. She loves little things, and when she finds a teeny tiny camera on the playground she is convinced it is the best thing she has ever found. When someone says it is their camera she creates a lie to say that it is actually hers. Her teacher says they will resolve it later. What I love is that it doesn’t take an adult trying to help figure it out to get the bottom of it. Ruthie’s conscious works for her, and she feels sick about what she has done. Her parents encourage her when she comes to them. They know it can be made right. Ruthie is given grace as as she comes clean – from her parents, her teacher and her friend. Parenting isn’t making our kids do the right thing all the time. It is reaching their heart and teaching them that when we mess up, which we will a lot, there is forgiveness and grace. As our conscious is made clear, we can come to a peace with God, others and ourselves. 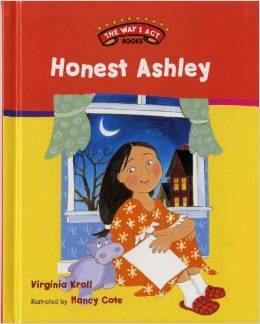 Honest Ashley (Way I Act) – This was a cute book about learning not to cheat on school work. Ashley got distracted throughout the week and didn’t get her writing homework complete. She had several temptations to cheat, but she knew it was wrong and felt deep conviction to make the right choice. She valued honesty, and it was obvious, in the end, that she would have been caught if she had chosen to cheat. Her alternative to cheating was to wake up early to rush and try it to get done. She received a lesser grade because of her rushed homework experience, but she was content that it was an honest grade. 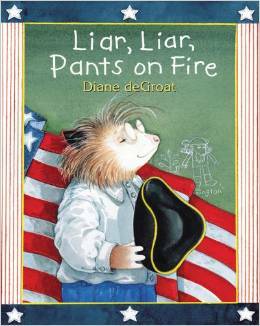 Liar, Liar, Pants on Fire – This is a story about a student named Gilbert who is set to play the role of George Washington at a school play. He feels very unequipped to play the role and is nervous about the performance. His line is “I cannot tell a lie. I cut down the cherry tree. I am sorry.” This is his journey of learning to tell the truth himself. It’s a cute little book that teaches kids that sometimes it is hard to tell the truth. However, saying sorry can make up for a lot of mistakes. The Boy Who Cried Bigfoot! 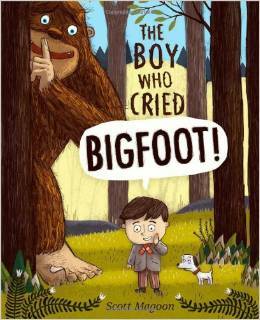 – This is a cute rendition of “The Boy Who Cried Wolf.” I love how the story is told from Bigfoot’s perspective. The illustrations are really fun. The characters are likable. As with the classic tale, this little boy learns that when you cry wolf, no one can trust you when you have a true tale to tell. Honesty (Learn About Values) – This is a book that is not a story. It is more direct instruction giving definitions, examples and guidance. It features real pictures of real kids. 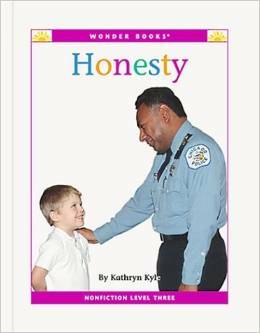 It is relatable and gives kids directions about honesty in a variety of situations. It shows kids how to be honest at school, dealing with money, playing games, waiting in line, with food, at home, and discusses why honesty is so important. I recommend these kind of direct instruction books for teaching the kids. It is good to incorporate these kind of books with other books that are more narrative in nature. 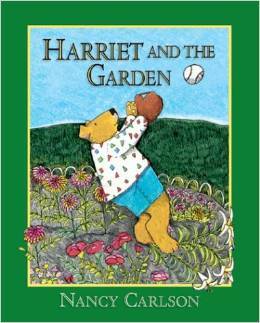 Harriet and the Garden (Nancy Carlson’s Neighborhood) – This is a book about Harriet who is playing ball with some friends. She accidentally falls into a neighbors prize winning flower bed. Rather than admitting what she has done, she runs away quickly to avoid getting caught. However, the guilt eats at her, and she eventually goes back to own up to what she has done. It’s a good lesson in how challenging it can be to tell the truth but how we are often met with grace and forgiveness when we are just willing to be honest. 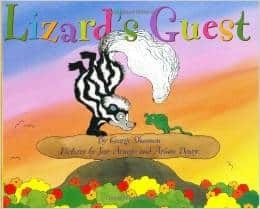 Lizard’s Guest (Junior Library Guild Selection) – I really enjoyed this book because it is so relatable. I have a dramatic child in my world who often falls into the same trap as skunk did in this story. Lizard accidentally stepped on skunks toe. Skunk played it for all it was worth. He sent little lizard out on all sorts of errands. While lizard was away, skunk would dance and play and run around. However, drama surrounding the pain would set in again once lizard returned from his errands for skunk. Lizard eventually got wise and was able to trick skunk into revealing the truth about the injury. I think this was a good story for my own dramatic daughter to hear. Often times, drama is its own kind of dishonesty.